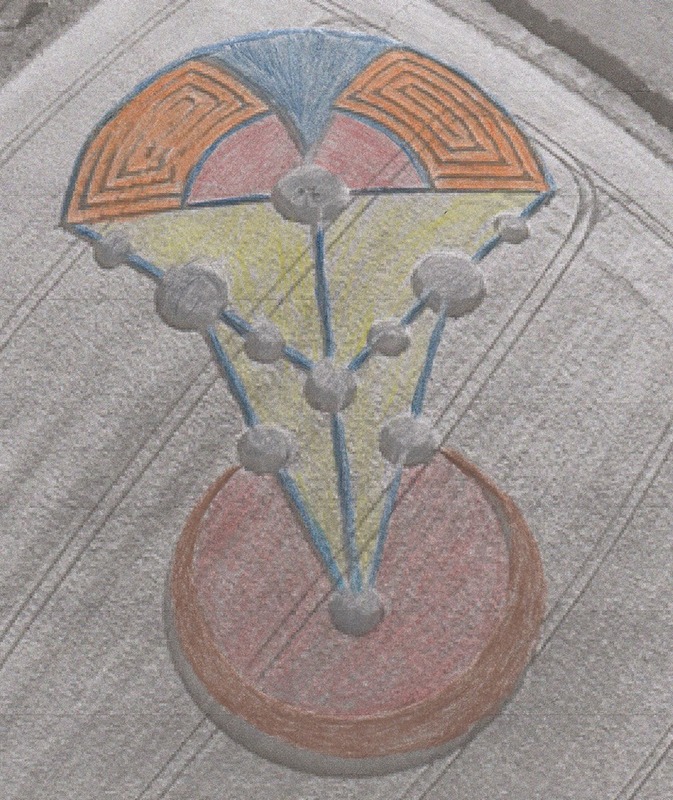 Crop circle discovered on 18 June 2014, in England. (I couldn’t find the exact location of it.) Translated by Suzanna Maria Emmanuel, guided by HALISARIUS, one of the greatest leaders on the Galactic Federation of Light Society. Namaste, I send much love and light to you always What you are looking at is one of the most powerful converters of energy in the spaces of the star dimensions. This is incredibly advanced technology, which originally was created for good, but taken by star beings not in the love. They used it for their greatest greed which resulted in the greatest destruction of many universes. What could be more powerful than nuclear fusion power? Well, there are much greater forces in the universe that go well beyond our knowledge and comprehension of time, space and dimensional forces. Star beings work with different frequencies, with higher understanding than us and they do not work with our time and forces that we know. This machine was known as the ‘Great Accelerator,’ as it converts one energy to another to help accelerate growth in whatever area it so desired. The blue universes was where all DNA blueprints were found from all universes. All life, in the love flows, was kept highly on guard, on planets, so that all life on the higher dimensions was able to stay safe and away from genetic engineers not in the love who could manipulate the most beautiful creation and change it to their own species, used for slavery and torture instead, to create more power and energy for their own greed. There were those who rebelled against Universal Love and removed themselves from the ultimate power source, that of love. They could not create their own technology, nor their own life forms as they could not tap into higher intelligence dimensions. The beings in the Divine Love Universes were able to tap into higher intelligence dimensions. This machine was able to create power for the universes working with Divine Will to constantly create more technology, higher life existence, and also to create youth, health, beauty for all life in the most beautiful universes. Walls were created around the blue universes which were made up of an electronic field, using incredible amounts of power. All this was able to be created with this machine. This machine, was able to go into power source, the magnetic grids, and draw power in and then convert it to the perfect frequency needed to create the most beautiful desired results. It can also be used to create holographic universes, as directed by Divine Himself, to allow more life to exist, and then placing DNA from the blue universes on those planets, to allow growth and life to thrive. The darkness also longed for this technology, not to create life, but to take it for their own power and glory. They took it 'unlawfully,' by destroying many universes. As the machine harmonizes with the frequency of its current owners, they were able to go into the magnificent magnetic grid systems and convert that beautiful energy into anger energy with which they could harmonize with. They placed it in their own sun, which they used to store their energy in. The dark beings used this machine to create massive destruction by pointing it at certain planets, drawing away its life force energy and converting it to power for them. In this way, they created more strength for themselves. The greater their strength increased, the greater the fear of many star beings became, and this created more power for them, as they connected the fear and pain to their own systems to feed from. It is wonderful to know that they, the darkness can no longer use this technology for their own destructive purposes, as rules and regulations came into place with the Galactic Federation. It is at present (from Halisarius), ‘out of action,' for them so it can do no more harm.’ This is why, the only ‘food’ they, the darkness, have is the stored energy in their ‘sun’ and also from our fear and anger. Once more people come into the love, they can no longer feed from our people either. This energy converter also has many other secrets, which we are ‘permitted’ to know about. ⭐Can bring all life codes of beauty, which were on our planet earth a long time ago, back to our planet. ⭐It can bring the right conditions to our plane, to allow our planet to thrive once again, with clean water, thriving animals and beautiful conditions for growth. What a beautiful glimpse we are receiving now. Already HALISARIUS, in his great teachings (up on youtube ‘Suzanna Maria Emmanuel’), has already stated that the technology to clean up pollution, to bring all things back into balance, already exists. His book (transmitted through, and authored by, Suzanna Maria Emmanuel) will also be released in the near future. It reveals our true history and where we came from and has many truths for mankind which the darkness hoped had been forgotten forever. However, to obtain this technology we need to climb up higher into the love dimensions, otherwise this same technology, which was created to protect, to heal, to grow life and create eternal power with, for perfect DNA and life to exist, would be used, once again, for destructive purposes. How wise Star Beings of Love are. How much we still have to learn. It is my prayer too, that one day we live in harmony together and that we receive this technology to heal all life here upon the earth, and live in happiness, love and peace. ⭐This machine is called, ‘The Great Accelerator.’ It is used to draw energy away from a power source and convert it to the perfect frequency for protection, love, eternal energy, health and peace. It is also used to create holographic universes. ⭐This machine, when it powers up, rotates very fast. It creates a vortex for gateways. ⭐It can be used to travel time by tapping into different frequencies because there is in reality, no time because time is another frequency within all frequencies. ⭐Because of its fast rotation and the special metals it has, (it defies all laws of physics as we know it, such as gravity, weight, heat etc, ) it creates a second field. This second field is a mirror image of the machine as it becomes a holographic field. ⭐Each metal ball connects into different universes and is all balanced. If it had a wobble during rotation it could collapse whole universes out of existence. ⭐The machine itself is larger, or very close to, the size of Jupiter. ⭐The blue metal on the top is a very special metal not found on our planet. ⭐This blue metal withstands any heat or cold, and is able to change, depending on the programmes placed in the computer system of the machine. ⭐It can tap into incredible power and then it is brought into great insulation chambers (the orange parts) and also into filters (the reddish parts) before it is transferred into the mirrors, (yellow parts) which converts energy from one frequency to another. ⭐It is then stored in the holding chambers at the bottom, which, after the process has been completed, is able to be tapped into by other large machines, stored for future use. We need to remember to stay in the forgiveness and forgive all that has been to allow all beauty to come back to us.